Snap On Verus W/ Personality Keys Updated to 17.2. New battery bought last year. Extra extension cable for a total of 15'. Bi-directional Scan-tool. Read/Clear codes. Activate system components. Perform injector balance tests. Cylinder contribution tests. Program Key fobs. Reset Adaptives. And much more. 4 channel Lab-scope. Digital Graphing meter. 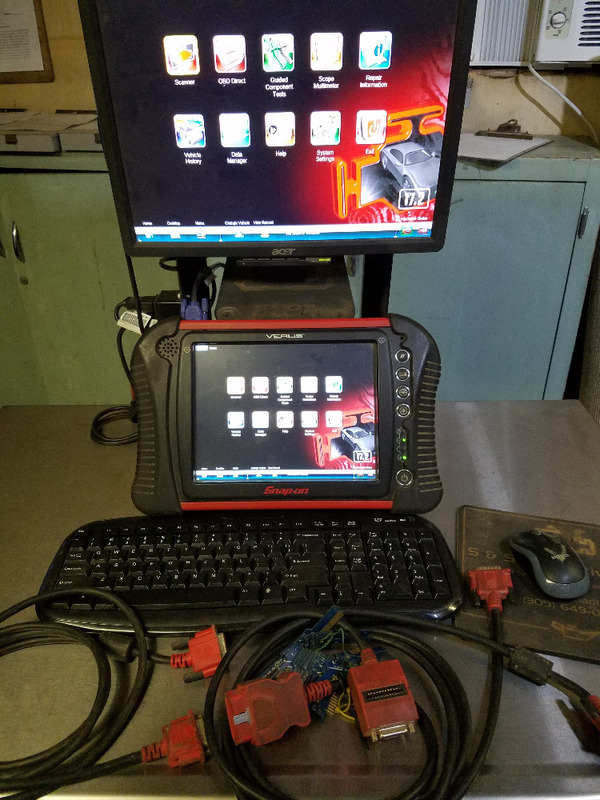 Snap On's Guided Component testing gives you component locations, Connector pin-outs, Wire colors, and more. It will even set your scope to the proper settings to test the Component in question. Windows based. Switch from Scanner to Internet Browser. Wifi, Print codes and freeze-frame data via wifi. Bluetooth. External monitor mouse and keyboard not included. Last edit: 06 Feb 2019 18:42 by pole71. For some reason, I can't post a link to the Ebay listing. But if you go to Ebay.com, the seller ID is ss_services. Copy and paste the item number into the Ebay search. Last edit: 18 Aug 2018 07:58 by pole71. No eBay APP ID défined in Kunena configurationThis work? Edit-Nope. Wonder why eBay links won't work? Last edit: 18 Aug 2018 15:17 by GypsyR. That's a new one on me. I've been on other forums where for whatever reasons they banned links to eBay auctions. On those the solution was to just give people the item number as Pole71 did. Kind of a lame workaround in this day and age. The Kunena thing is new to me. And why is there an accent over the "e" in the error message? GypsyR wrote: And why is there an accent over the "e" in the error message? Because... reasons? That error message is new, actually. Used to be, you'd post an eBay link and it'd just come up as blank space. Must have come in during one of the updates. I'll inquire with management, see if that's something we can fix. To me it's more a curiosity than a problem. How often do folks here want to link to something on eBay anyway? So, now, I have it back, again. I have another Verus (pro), a Vantage Ultra, an Ethos Tech, and a Picoscope. I do not need this Verus. I have tried to sell it locally, on Facebook, and eBay. I am, almost, done trying to sell it. If anyone on this forum is interested, I am willing to, almost, give it away. I consider $500 "Giving it away". If I can't get $500, I will let it stay in my bottom drawer, as a spare. If I receive more than one offer, the highest bidder will take it. There is nothing, major, wrong with this Verus (the brightness buttons do not work, but the brightness is fine), and I would like for someone to get some use out of it. It is the FIRST edition of the Verus (with the personality keys) It is NOT wireless. It is updated to software version 17.2 (I paid $1250 for this just last year) and will cover cars up to 2017. It can NOT be updated any further. It has a new battery that was purchased, last year. Last edit: 13 Sep 2018 18:13 by pole71. Just to help out, I've used this type of verus and the scope on that is 99% identical to the one on the Verus Pro with minor differences in terms and wording. Just in case anyone was wondering. Confirm what it's not, and fix what it is! That's an excellent price on that Verus. That's the same one I have (mines only got 15.4 software). I use a Solus for scanning, but still use the Verus for the scope every day. Last edit: 15 Sep 2018 12:07 by Noah. Excellent! Glad you were able to unload it.